court reporting Lake Oswego Oregon | Todd Olivas & Associates v3.0 | Court Reporting Services in Orange County, Riverside, San Bernardino, San Diego, Los Angeles, Irvine, Santa Ana, San Jose, Sacramento, Fresno, San Francisco, Bakersfield. TO&A employs no court reporters, interpreters or videographers of our own. The providers we send are fully qualified and reliable independent contractors. Welcome to Lake Oswego! We're proud to have access to one of the best deposition-taking environments anywhere in town. If you're looking for a deposition suite that facilitates a quality court reporting, interpreting and videography service -- look no further! The TO&A Lake Oswego Deposition Center is located in the beautiful Kruse Woods Corporate Park, which provides our court reporting clients access to one of Portland’s most prestigious business addresses. The Center is conveniently located to Portland’s Highway 217, I-5 and I-205. The Corporate Park offers amenities such as Starbucks, fitness centers, banks, print shops, dry cleaning, and upscale delis. Our clients will find comfort and productivity within our Center, featuring a Business Lounge, and three fully appointed conference/deposition rooms which can accommodate 3-12 people. 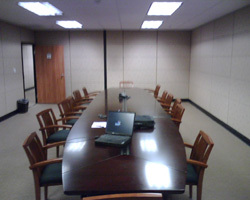 State-of-the-art audio/visual equipment is provided, including wireless high speed internet, LCD projector, flipcharts, white-boards and conference call capabilities. Our onsite litigation support team is available to provide professional administrative support. The Center also offers amenities such as catering, coffee and water service, all to ensure our clients have the infrastructure in place to work at their best! Locally, in the City of Lake Oswego, are many upscale hotels and restaurants for casual and fine dining, and the largest covered shopping facility in the state – the Washington Square Mall. To schedule a Lake Oswego Court Reporter, please schedule online or call (888) 566-0253. We'll provide you with a freelance court reporter, interpreter, and videographer in Lake Oswego, Oregon. The court reporters we send are state licensed (where applicable), and always prompt and courteous. Our goal is your complete satisfaction which is why we only work with the best court reporters available. Our interpreters are all certified, all languages -- and be sure to tell us which dialect you need if it's an exotic language.